The Marcum VX 1 Pro comes equipped with 1000 watts of power, a rechargeable battery, as well as a soft, sleek and protective carrying pack. 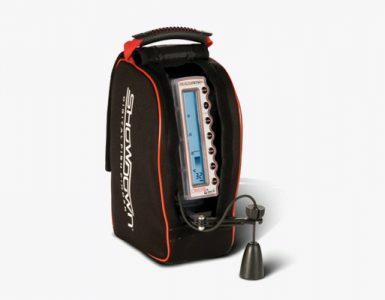 What makes this unit a standout is that it is very light compared to other fish finder models. The dimensions of this flasher are also relatively smaller at 9.2 x 10.2 x 8.5 inches, thus making this unit very portable and extremely lightweight. The manufacturer of this unit uses a patented 10 level interference rejection to keep the signal clear and clean. It also has a very impressive 2-inch target separation. It presents a vital zoom feature which is helpful when you have already found your perfect location. Marcum VX 1 only comes with a 20-degree transducer. A lot of users of this unit testify to its ease of use, as well as the way in which the battery life works well as advertised. What this flasher can boast of is its capability to focus on one particular fishing activity: ice fishing. It is one unit that shouts of professional level performance. Among the features that are highly praised by many users is MarCum’s patented interference rejection, a super readable and bright display, an automatic, adjustable bottom lock zoom, 1000 watts of power, as well as precise structure and sensitivity to fish identification. Marcum VX1 also comes with a 3-stage auto battery charger, 12V 9 amp battery, 8 in cable, as well as electronics shuffle along with an adjustable transducer arm. All of these are contained inside a red padded soft pack for easier organization. Despite the fact that this is considered on the low end among the Marcum models, it is quite surprising to see the way this unit actually works. Also, a lot of users have commented as to how easy the zoom feature is to use. You only need to press one button. Once this unit arrives in a bag, you do not have to worry about set up, as it is ready to use right at the very moment you pull this unit out. If you are looking for a good investment for your ice fishing activity, this flasher is your best option. In the world of fish finding, there are various names and players currently competing for the attention of different anglers. There are also several manufacturers offering different units which come with different advantages and disadvantages. The choice is in your hands. However, you also need to be aware of the other options that are available. For instance, Lowrance has introduced its HDS 5 as part of its series of fish finders. This particular unit comes as a combo of a chart plotter and a fish finder. It is known to be versatile and compact. It also comes with a very small footprint, which is great for users who are looking for a multifunctional unit that also saves space. Another option is the Deeper fish finder which can be paired with your smart device, thus allowing you to read details right on the screen of your smartphone or tablet. The Deeper fish finder uses Bluetooth technology when it comes to relaying data to your gadget. Because of this, you can also expect lower battery consumption. Also, there is no need to use cellular data for this unit to work. You may also use internet connection easily while fishing. When comparing these two aforementioned units to this ice fishing flasher, there is a huge difference when it comes to the purpose of use. For one, the Marcum VX 1 Pro ice fishing sonar system is primarily intended for ice fishing. It also comes with particular features that are highly useful for this type of activity. 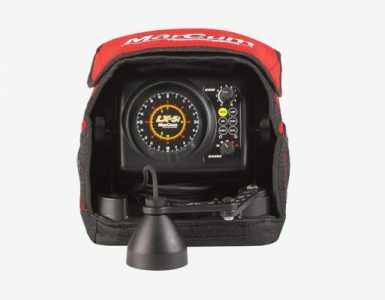 If you are looking for the best deal when it comes to flasher which can be used for ice fishing, the Marcum VX 1 ice fishing sonar is your best choice. It comes with features that are extremely helpful in this type of fishing activity. Marcum embarked on a relentless quest in designing the best and most technologically advanced electronics in ice fishing. As a result, they have come up with a durable, functional, as well as user-friendly technology which can satisfy the needs of different anglers, whether professional, occasional or casual anglers. This reason alone already justifies the role being played by this ice fishing flasher. It is very easy to use, thanks to the instruction manual that comes along with it. The unit also comes as ready to use from the moment it is pulled out right from its soft red bag. While it has been introduced as an entry-level flasher, it is not really accurate because the intuitive operation and extremely useful features allow it to easily compete with other models on the market. 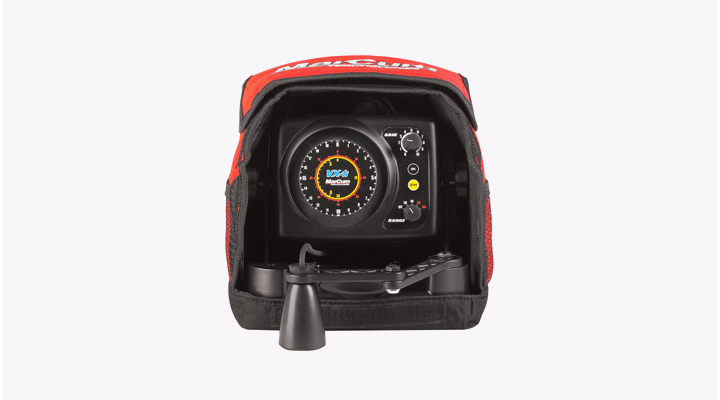 The Marcum VX 1 Pro best ice fishing sonar is equipped with features that are not generally available in other systems that cost several hundred more. This particular model comes with a reliable battery, charger, as well as a soft pack. When choosing a flasher for your next ice fishing adventure, this unit will certainly make it on your list.